NTS temperature device. 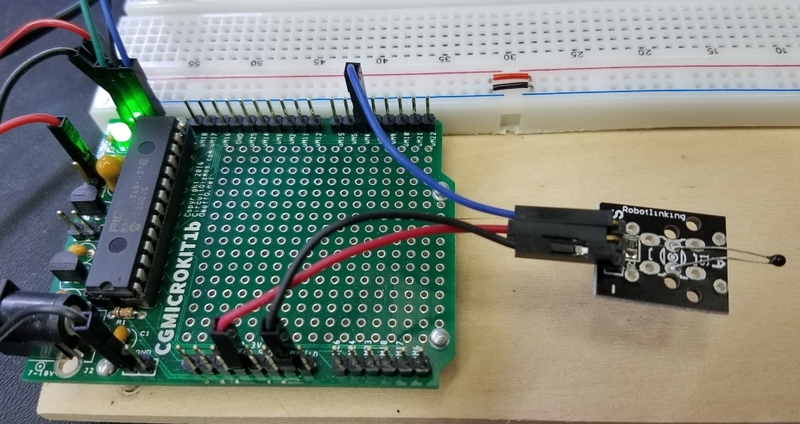 Connected in series with a 10kohm to use as a voltage divider circuit. This device is NOT linear. When the temperature increases, the resistance decreases. 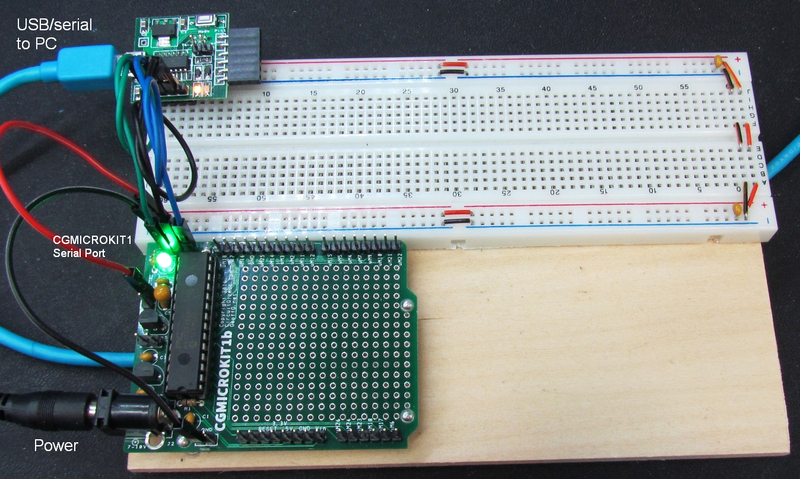 Read of analog temperature sensor with CGMICROKIT1, console display. This test uses an analog input to read the temperature values every 200 milliseconds. The value is printed out on the console. Wiring the Analog Temperature Sensor to the CGMICROKIT1. Line 5: Read the analog input. Line 6: Print the analog values. 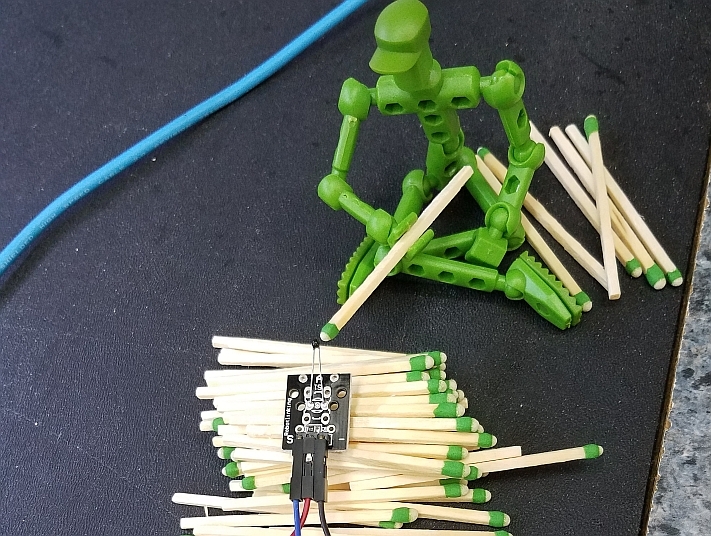 The output shows a couple of seconds of the sensor output at room temperature, then a drop in voltage as the temperature increases from touching the thermistor. There is a drop in the voltage as the temperature increases because this is a negative temperature coefficient thermistor. 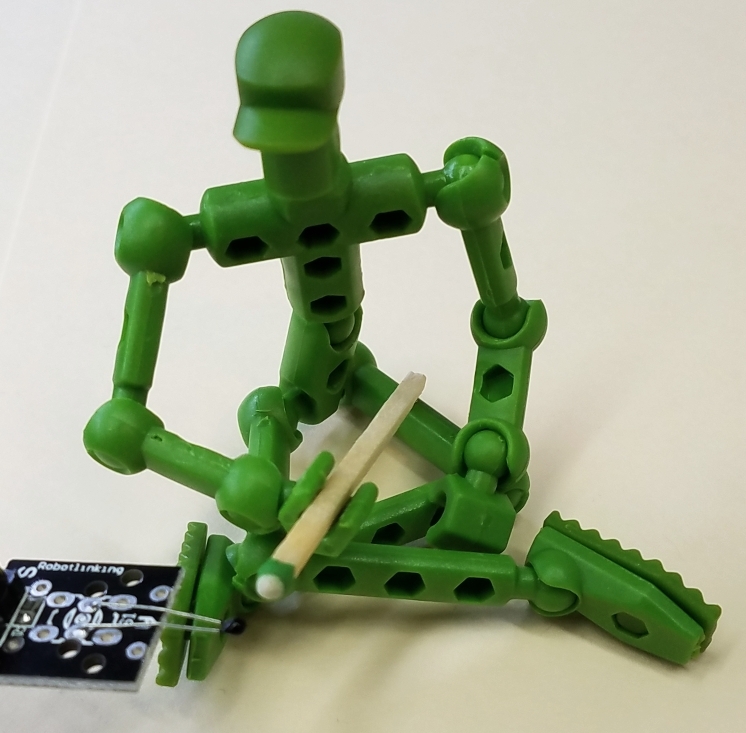 For this module and the default way to wire +Voltage and Ground, the resistor divider has the fixed resistor connected to +Voltage, and the variable resistor (the thermistor) connected to ground. The signal/voltage read is at the “middle” junction between the 10k fixed resistor and the thermistor. 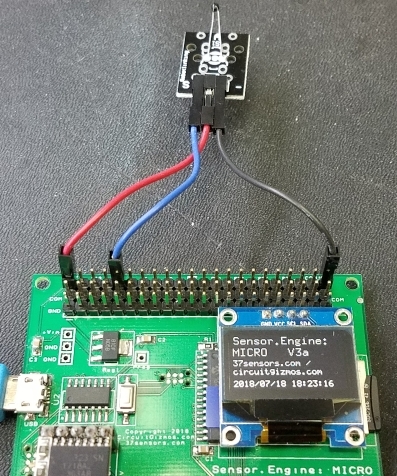 Read of analog temperature with Sensor.Engine:MICRO, console display. The same type of test as test 8 can be performed with a Sensor.Engine: MICRO. This test code utilizes the Steinhart-Hart equation to convert the measured voltage and known resistances to Kelvin, Celcius, and Fahrenheit. The sensor wiring is described in test 10. Line 2-7: Set up floating point variables for measurements and calculations. Line 9 and 18: Loop forever. Line 11: Read the input. Line 12: Calculate the thermistor resistance. Line 13 – 14: Steinhart-Hart calculations for degrees Kelvin. Line 15: Conversion to Celcius. Line 16: Conversion to Fahrenheit. Line 15: Printing of all three temperature scales. My assistant Mo heating up the thermistor. Sensor output changing from room temperature to a nice toasty temperature. You know, perhaps it wasn’t a great idea to give Mo matches. I keep smelling things burning. But my assistant did help by warming up the temperature sensor. 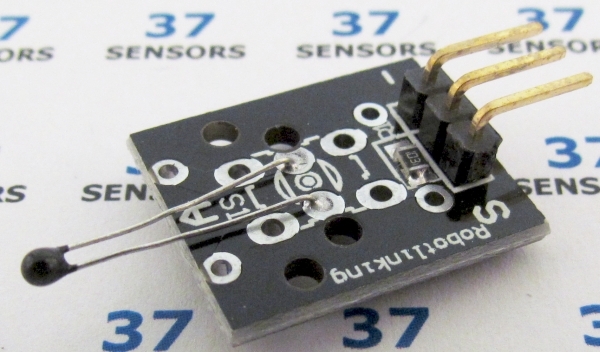 Read of analog temperature sensor with Sensor.Engine:MICRO, output on LCD display. This test uses an analog input to read the temperature values every 200 milliseconds. This code also utilizes the Steinhart-Hart equation. A press of the green button flips between displaying C or F.
Test 10 Analog Temperature sensor wiring. Line 1-2: Set pin 4 to analog input, pin 26 (green button) to digital input with internal pullup. Line 3-8: Set up floating point variables for measurements and calculations. Line 10: Set temperature display toggle to 0 (Celcius). Line 12 and 28: Loop forever. Line 14: If pin happens to be pushed, toggle C/F. Line 15: Read the input. Line 16: Calculate the thermistor resistance. Line 17 – 18: Steinhart-Hart calculations for degrees Kelvin. Line 19: Conversion to Celcius. Line 20: Conversion to Fahrenheit. Line 21, 24, and 27: Print either C/F on LCD. Line 22: Print “Fahrenheit” on LCD. 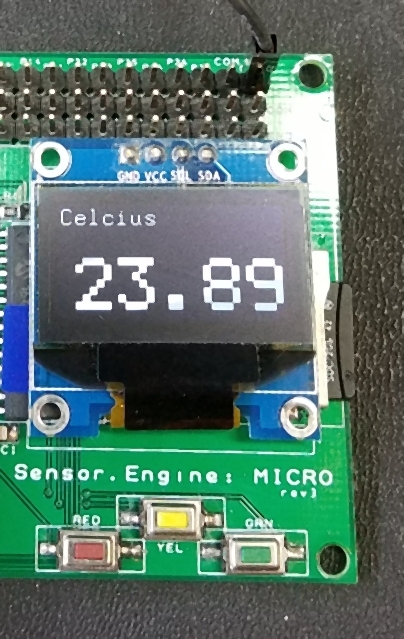 Line 23: Scale the values for the 128×64 display and print temperature in F.
Line 25: Print “Celcius” on LCD. Line 26: Scale the values for the 128×64 display and print temperature in C.
Display showing room (lab) temperature in Celcius. 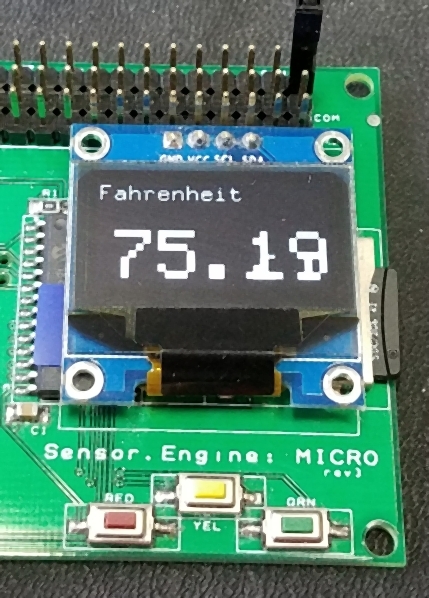 Display showing room (lab) temperature in Fahrenheit. Great. I let him play with matches once and my assistant becomes a pyromaniac. No more matches for Mo.